Join this gay group trip in Puglia in Italy which is renowned for its tradition and being a region of culinary excellence. With its mountain towns near to seaside villages, you’ll also find stunning properties, castles and cave homes that date from before the Renaissance. On this trip sample fine Italian food and wine and stay each evening in a 14th-century villa which has been restored to its historic glory by a gay American with deep family roots in the soil of Puglia. Arrive into Bari where a transfer awaits for you to Villa Cappelli, just a short distance from the Adriatic Sea. Once settled you’ll enjoy a light lunch and in the afternoon explore the grounds. In the evening you will enjoy a welcome dinner with the rest of the group whilst you sample the local olive oil and wines of the region. In the morning, visit the Murgia National Park to witness mozzarella being made before your very eyes — and of course try it! Choose a variety of cheeses to enjoy for lunch and throughout the week. After this you’ll visit the nearby Ruvo di Puglia and the Jatta Museum, famous for its Grecian Urns before returning to the villa for lunch. If you’d like to join in cooking lunch then you can or perhaps you’d rather relax by the pool. 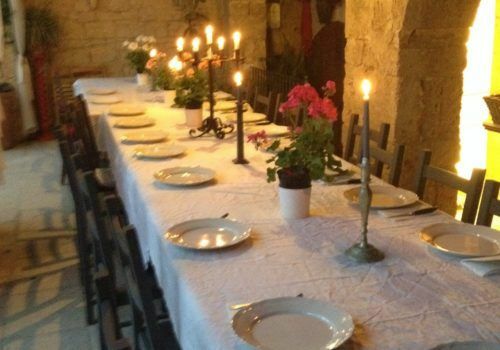 In the afternoon enjoy exploring Puglia before visiting nearby Terlizzi in the evening for a delicious group dinner. Today you’ll make fresh pasta in the villa’s kitchen before letting it dry for this evening’s meal. You’ll then visit Castel del Monte, a UNESCO World Heritage Site, which was built in the 13th century by the Swabian Emperor, Frederick II. The castle is featured in many myths and legends, including the Holy Grail. After a tour of the castle, head back to the villa for a light lunch. After lunch, guests can enjoy some down time at the villa. Later in the afternoon, an olive oil expert will visit the villa for a course in olive oil production and olive oil tasting. This evening you’ll taste the fresh pasta you made with your dinner. Today travel to the beautiful seaside town of Trani. Its giant cathedral and beautiful port sits right on the sea. Visit the site of the Battle of Canae before heading to Antichi Sapori where you’ll enjoy a special lunch in a remote restaurant with a chef who is multi-award winning. This is one meal you won’t want to miss. After a long lunch, we’ll head back to the villa to relax. Dinner tonight will be something light. Explore the mountainous region of Murgia en route to Matera, yet another incredible UNESCO World Heritage Site. Dating back centuries, the area has an authentic Italian feel to it and is still occupied by residents and restaurants that are built into its rock formations. The ancient and winding streets have been used in many a movie, including Mel Gibson’s The Passion of the Christ and the recent Ben Hur. Enjoy lunch in the town before heading back to the villa to relax. This evening you’ll learn to become an expert pizza chef. Choose your own toppings and cook in the villa’s own ancient wood-burning pizza oven. Today you’ll visit Alberobello, a town famous for its trulli, which are stone buildings made without any mortar. If you’ve ever seen a Puglian guidebook, these structures are often featured on the cover. After touring the town, you’ll visit the seaside town of Polignano a Mare. This city literally juts out into the sea so you’ll explore and enjoy the amazing views it affords. Have lunch at Grotta Palazzese which is named one of the top restaurants with a view as its dining area is built into caves. Set off early today to the Adriatic port of Bisceglie and its busy fish market, picking out some of the freshest seafood you will ever find — right off the boats minutes before. You’ll pick what you want for dinner before exploring a further quaint fishing village. Once back at the villa, there will be a wine tasting with lunch. A sommelier will visit the villa to help educate you in many of the local specialities. In the afternoon you’ll visit a nearby ceramics centre which has a kiln that dates back to 1AD. This evening gives you a chance to share an amazing farewell dinner of seafood at the villa. Today it’s time to head home; you’ll be transferred to Bari airport for your return flight.